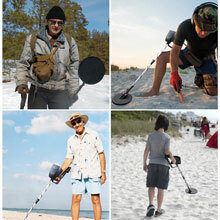 Enjoy hours on end of treasure hunting with this metal detector. 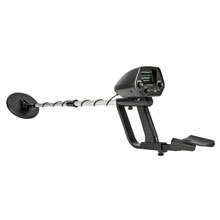 This state-of-the-art metal detector is packed with fully features that can easily assist both budding and seasoned treasure hunters to locate and identify objects buried underground, way before they even start digging. 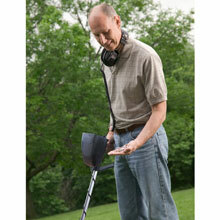 No more guessing if you hit the jackpot with this heavy duty, yet lightweight metal detector. 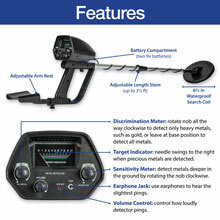 The 2 operation modes, speaker, headphone jack, discrimination and sensitivity controls, low battery light, waterproof coil and adjustable stem are just some of the features included in this beginner and professional treasure hunting metal detector. Assembly required. Takes 2 9 volt batteries (not included). 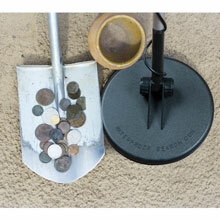 Overall size: 6½" wide, 45" long, 10½" high. 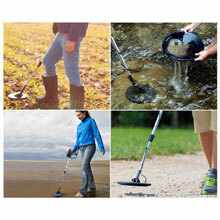 •PACKED WITH FEATURES: This no nonsense, all-terrain detector is ideal for hunting coins, relics, jewelry and even gold nuggets in shallow water, it is perfect for beginners and kids along with experienced treasure hunters. 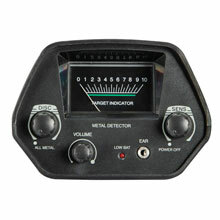 •EASY TO USE CONTROLS: Find exactly what you looking for, the discrimination feature allows you to eliminate unwanted targets, the built in speakers along with volume control mean no need for headphones (headphone jack available), 2 mode operations, low battery indication and sensitivity control to help in your hunt for buried treasure. 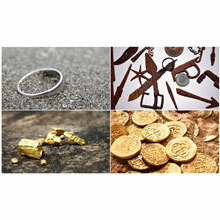 •WIDE APPLICATION: The possibilities of what you may find are endless, coins, both modern and old (possibly rare), are commonly found, as is lost jewelry, if you live in an area where Civil War battles were fought, you may find relics like bullets, buckles, and buttons from uniforms, along with other precious metal artifacts. 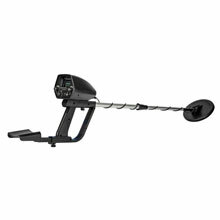 •6" WATERPROOF SEARCH COIL: Is designed to make metal detection more sensitive, both the adjustable stem and coil (not the control housing) are waterproof, making this gold digger perfect for metal detecting activities in both wet and dry surroundings, all season resistance. •MAKE A GREAT GIFT: With its adjustable stem this metal detector and go from 33 to 44 inches long so that it will adapt for both children and adults, making this a perfect gift for the family, enjoy the family time and fun that treasure hunting will provide.